The most seat of your pants improvement over any upgrade and the last ball joint you will buy for your Dodge Ram HD truck. Constructed out of specially chosen material, CNC machined, then hardened to a high Rockwell and put through a dry lubrication 2-stage process. The ball joints start out as a chunk of specialty chosen material which is machined to Carli's unique design and then heat treated to a specified rockwell (hardness). From there the ball joints head to an aero-space lube company where a proprietary dry-lube coating is applied to our specified thickness. And of course Carli Suspension tops them off with an accessible zirk fitting for easy servicing, plus we even include a tube of high quality synthetic grease with each ball joint set. If you are experiencing loose / wandering steering or death wobble buy these now! There are many options available some that have a lifetime part warranty that will last for a while and some other high end options only $150 less that have a 1 year warranty. Why take the risk of having to buy replacement parts to rebuild your ball joints or even go through the hassle of replacing an inferior lifetime part constantly when you can install the Carli Ball Joints once and never have to mess with it again...? We make this statement since it is a common consideration for many people and we often go through the options with people who go another route only to call us in the near future to purchase these Carli Ball Joints after experiencing part failures. Do it once, the right way and be done with it! In leu of enumerating the materials, processes and design characteristics of Carli's Ball Joints, we're just going to stand behind this component for as long as you own it. 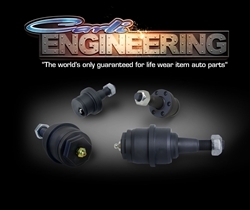 If for any reason the performance of Carli Ball Joint declines, we'll stand behind it. For the life of your purchase. After the finalization of the R&D process we are confident that this part will never fail.